Wood salad hands to delight you! Wood salad hands serve a great purpose other than serving salad! Somebody must have invented the name Salad Hands after making a set to replace the actual hands that some folks used for taking salad from a salad bowl! 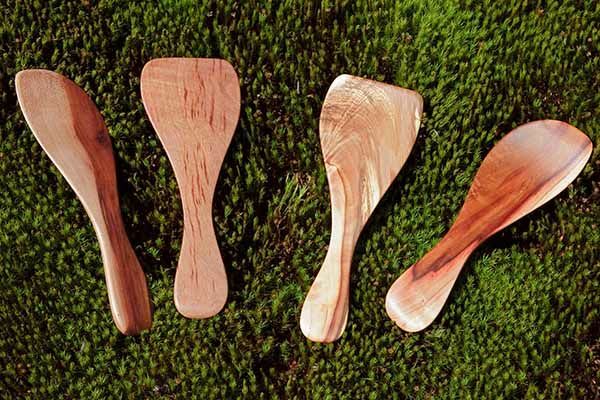 Smaller than regular wooden salad serving sets, these wood salad hands are fun to use. 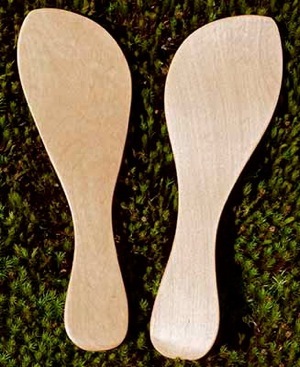 They easily grab your salad because of the ample size of the blades and have become one of my top selling wood craft gifts...a very popular choice. Made from Arbutus trees of the Pacific Northwest, the beauty of the wood and the ease of use make these wooden salad sets a winner. 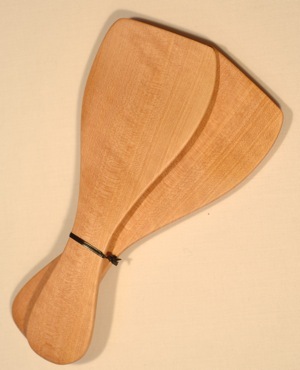 You can use one wood salad hand for serving at the table cooked dishes like a casserole or baked loaf. You can use the blade to cut straight though like a mini wood spatula. 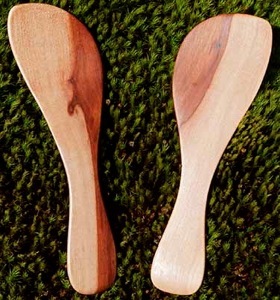 They also some come in a rounded style and these flat small wooden spoons are also perfect for salad and can be used individually as food servers. They thus come in this style in both lefties and righties. They make especially great left handed gifts. I also find them excellent in the kitchen for cooking. 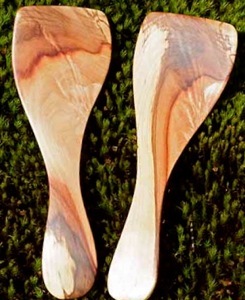 As small wooden serving spoons, I use these rounded ones for stirring in small pans and then for serving onto plates. I really like the ones in the shape of a mini wood spatula for my fried eggs. 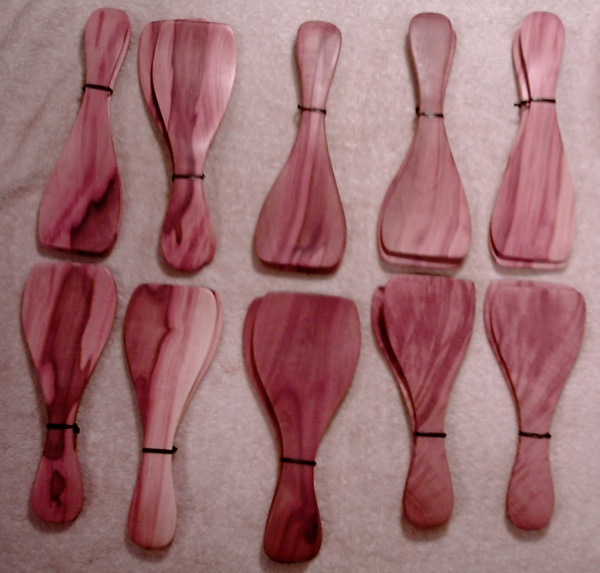 Many customers buy them as wood wedding gifts or for ecofriendly gifts for the green footprint they provide. Because of their small size, they are perfect in specialty gift baskets. Here is another use for wood salad hands: they make a superb toddler wooden toy! Toddlers love using them at the beach for digging in the sand. And because of the natural food safe finish it doesn't matter if they chew on the edge. In fact, it will help when teething! 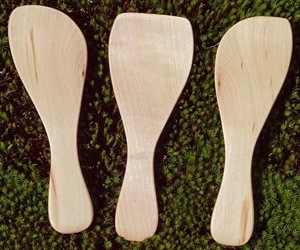 As wooden toys for kids, these hands can be used by them in the kitchen for help stirring or serving because of the small size. 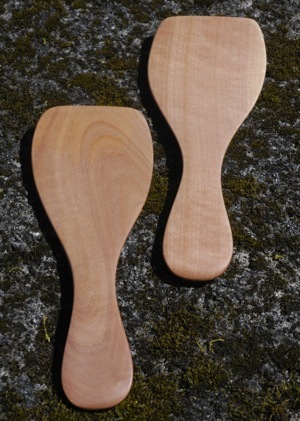 My wood salad hands come in one size only and are approximately 7.5 inches or 19cm long. Your hands will love 'em! In the images above the left picture (straight hands) is a Supreme Selection while the right one (rounded hands) is an Ultra Selection. The top image on the page is a mixture of both. Please click here to see the different labels for each grade. All hands are handmade! This means each piece is unique. They will not exactly match what you see in the photos. It will match the quality and styles you see in the pictures. All salad hands have a natural food safe wood finish: a quality walnut oil wood finish that enriches the grain. The Ultra and Supreme Selections have an additional food safe wood finish of my special combination of walnut oil, beeswax and orange oil. The above images are typical Deluxe selections, showing a set and single hands with one of many of my left handed items. The above Ultra selections Straight Tip and Rounded Tip sets. A richer grain and a finer, smoother finish than Deluxe. Ultras are a good choice to make as they offer the best value of quality and price for either a personal gift or a special one as a green wedding gift. 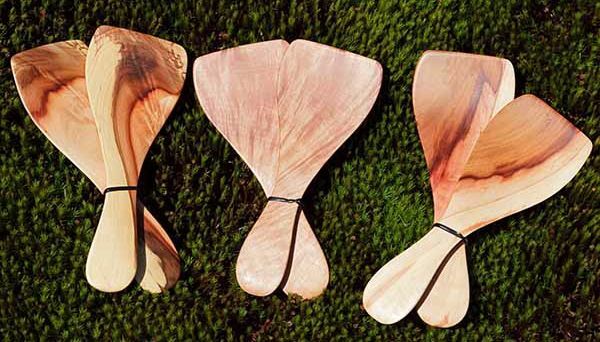 If you want a memorable eco friendly gift (truly made from eco friendly wood) or a winning wood wedding gift, then one of these Supreme sets of collectors' spoons will surely make a positive impression. There are so many variations in the wood. It is impossible to show the full range of textures, colorings, grain lines and patterns as well as the fine finish on these lovely wod salad hands. But they are sure to delight the users! Have Feedback On Your Purchase? Let Us Know!